A stunning late strike from red-hot Tottenham Hotspur winger Gareth Bale lifted the Londoners to a 3-2 win over West Ham United on Monday that took them up to third in the Premier League table. Bale, who has scored eight times in his last six games, also netted the game's opener after 13 minutes but he left his best until the 90th minute when he unleashed a rocket of a shot past goalkeeper Jussi Jaaskelainen. Spurs went two points clear of Chelsea on 51 points while West Ham dropped to 14th on a poignant night for the east London club, who honoured former player and England's 1966 World Cup-winning captain Bobby Moore on the 20th anniversary of his death. A 25th-minute penalty from Andy Carroll and a Joe Cole strike in the second half brought the home fans more cheer until Iceland midfielder Gylfi Sigurdsson levelled for Spurs with 14 minutes remaining and Bale completed the visitors' comeback. Former Finland keeper Jaaskelainen had been in brilliant form to deny Tottenham on several occasions but could do nothing but watch in desperation as Bale let rip from around 30 metres to break the hosts' hearts. Welshman Bale had signalled his intent early on when he took the ball outside the box and skirted a few challenges before sending a fierce shot into the crowd. Bale opened the scoring when he evaded the West Ham defenders having picked up the ball on the edge of the box before placing a low left-footed shot across Jaaskelainen into the net. "He's a super talent. 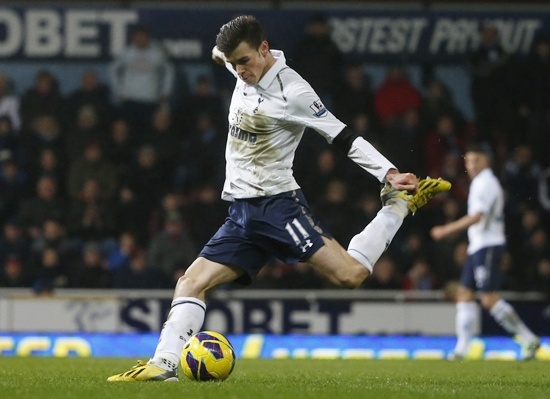 He's making the difference every single game," Tottenham manager Andre Villas-Boas told Sky Sports. Spurs goalkeeper Hugo Lloris was less busy than his counterpart but made a crucial intervention with his side 2-1 down when he stormed out of goal to deny Matt Taylor, who was clean through on the right side of the area. Bale said his team had never given up hope of a win to put them in an even stronger position to seal their highest Premier League finish, having finished fourth twice. "We haven't been thinking like that," Bale said when asked if the team had thought it was not their day. "We know what we're capable of and we're confident. We keep battling to the end. The team played really well." Tottenham play fifth-placed Arsenal, their north London neighbours, on Sunday.